Regional Radiology provides the advanced and innovative radiologic Cardiovascular and Thoracic Imaging. With our healthcare facility partners, we provide perform low dose Chest CT screening scans, pre-procedural super dimensional Chest CT scans, Calcium scoring, Cardiac CTA as well as general CT studies or oncological follow up. We offer low-dose screening Chest CT’s in high risk patients. Regional has been on the forefront of screening for lung cancer in high risk patients. In keeping with new guidelines from the National Institute of Health, we proudly offer non-invasive low-dose Chest CT. These studies are nearly 100% in detecting lung cancer and other smoking related lung disease. Coronary CT angiography and coronary calcium scoring are also effective, noninvasive tests for detecting cardiovascular disease, in particular, coronary artery disease. 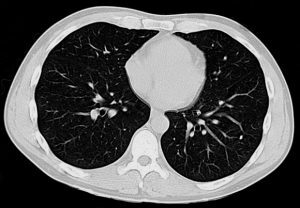 Our thoracic imaging section, headed by a felllowship trained thoracic radiologist works closely with your doctor and subspecialty physicians to provide detailed interpretations of high resolution CT scan of the chest.